Before we delve too deep into all the various aspects of diamonds (the four C’s, how they are measured, how we chose replacements, etc. ), I thought we should start out with a little bit of history. What exactly is a diamond? A diamond is a precious stone formed from an essentially colorless crystalline form of pure carbon. 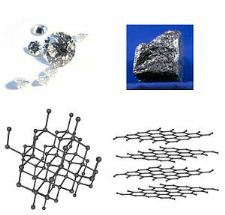 Interestingly, diamond and graphite are both pure forms of carbon. They are allotropes, or pure forms of the same element that differ in structure. Graphite is very soft, opaque and metallic black in color while diamond is transparent and the hardest substance known today. It’s interesting how the crystal structure of a mineral can change the properties so drastically! Diamonds are originally formed at depths of 140 to 190 kilometers in the Earth’s mantle. These depths provide the high-pressure and high-temperature conditions needed to maintain the growth of the carbon minerals, which will take over 1 billion years. They are brought to the surface in a type of igneous rock known as kimberlite which is found in former spheres of volcanic activity. The most common place to find kimberlite is near mountain ranges, in vertical shafts that extend deep into the earth. This is why you find so many mines near mountains! If you’ve ever visited the Rocky Mountains in Colorado you will have seen plenty! Diamonds are thought to have been originally discovered in riverbeds in India over 6000 years ago and were traded across countries during the medieval times. The Chinese were the first to recognize the amazing strength of the diamond and began using it to cut other stones. The Mohs scale is a hardness rating system developed in 1822 by Austrian Friedreich Mohs as a standard for mineral identification. It compares different minerals ability to resist scratches. On this scale, harder minerals with a higher number can scratch those with a lower number. Based on this, diamond is 4 times stronger than corundum, the next strongest mineral listed! Well now we know a little more about the history of a diamond, but what about its presence in society? The word ‘diamond’ stems from the Greek word adámas, which has translations of ‘unbreakable’, ‘invincible’ or ‘unconquerable’ and is a variant of Latin adamans, from the base of the English word ‘adamant’. The diamond has long been a fascinating presence in the world and when first discovered was thought to be magical. Because they were so rare, it became common superstition that the diamond lent its wearer special powers. Diamonds would be worn to battle to ensure victory, used as medical antidotes, placed in mouths to bring on loss of teeth and ground into powder to use as a poison. The diamond has historically been used as the gem of choice for engagement rings though. In medieval times the Italians called it the Pietra della Reconciliazone or ‘stone of reconciliation’ because it symbolized the upheld agreement between husband and wife. Today we approach diamonds with a little less superstition but no less reverence! There are many uses for diamonds in current society. Although normally of a lower grade than the traditional gemstone market, diamonds can be found in many industries today. Diamond tools last much longer than those made from other sources and offer a nearly unmatched precision in cutting other substances. Automobile and aircraft manufacturers have long used diamond-based tools as well as the mirror and optical fields. Oil and gas drilling, textile and construction industries and the medical field are also all in on the durability of the diamond as a tool. They were also used to make needles for record players! As you can see, diamonds have a much more versatile history than we generally take into consideration as we admire them. They’ve been a fascination to society for centuries and continue to be a symbol of love and commitment throughout the world.